Manage the full life cycle of a service call, and every aspect of your service business. Provides computer-based input, tracking, messaging, and associated processing for every incoming call. Features a custom, on-screen map of your specific service territory. Shows the relative geographic locations, and time, for each job, with every technician's route geographically displayed in color-coded, sequential fashion. Tracking time for each tech, a description of work done, parts used from stock, parts special-ordered and received, funds collected, etc. Automatically alerts to inactivity on any job and provides at-a-glance proof of status. Instantly shows stock inventory on each truck and in store room. Facilitates daily restock to each truck and restock from suppliers. Facilitates and records special orders with direct, internal fax transmission to suppliers. Records sale and completion of each job, compiles record of all sales, generates periodic reports showing totals, percentages in various categories, etc. Creates accounts receivable records, manages periodic dunning on past due accounts. 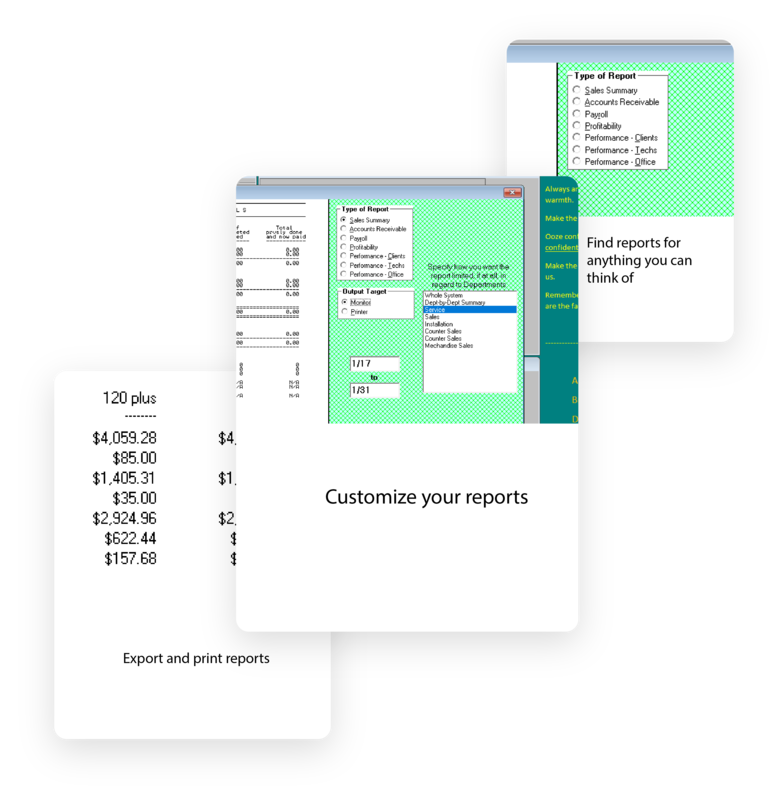 Generates commission reports based on sales, wage reports based on built-in TimeClock functions, etc. Does not write checks or do financial accounting, but integrates easily with any separate system. Managing calls has never been easier. ServiceDesk uses a system of Callsheets designed to replicate information you might fill out on a sticky note. 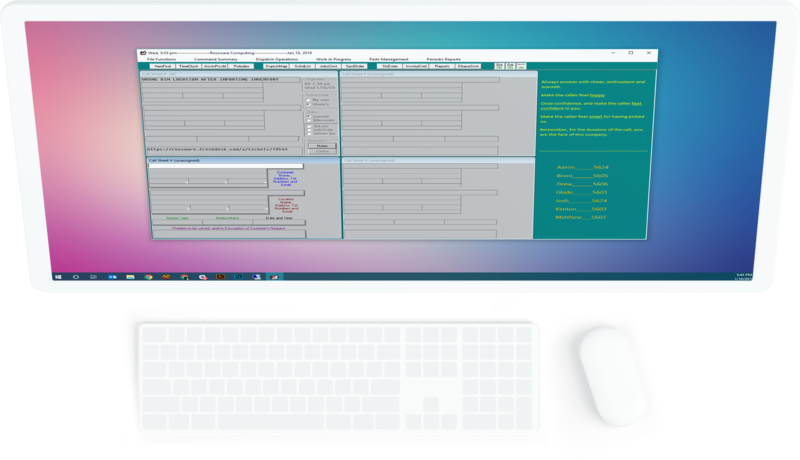 You can view four Callsheets to a screen-page (allowing you to see and use more information at once), on as many pages as you would like. Upon receiving a call, it is as simple as selecting the first open Callsheet to begin entering your customer's information and the information on the machine or service they need. Whether your service business is big or small, optimizing your dispatch process is one of the most effective ways of increasing your efficiency. 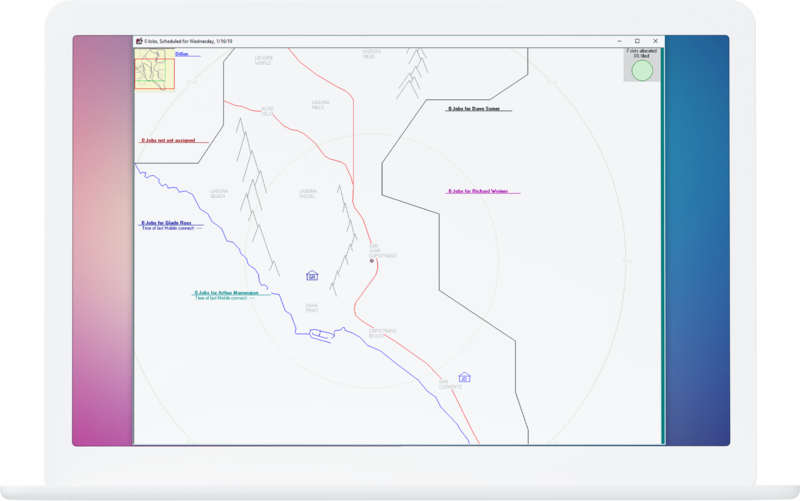 Our Dispatch Map system gives you a visual representation of where your technician's routes are. Some key features are address verification, and coming soon: automated route optimization. View stock inventory on each truck and in your store room. Facilitates daily restock to each truck and restock from suppliers. 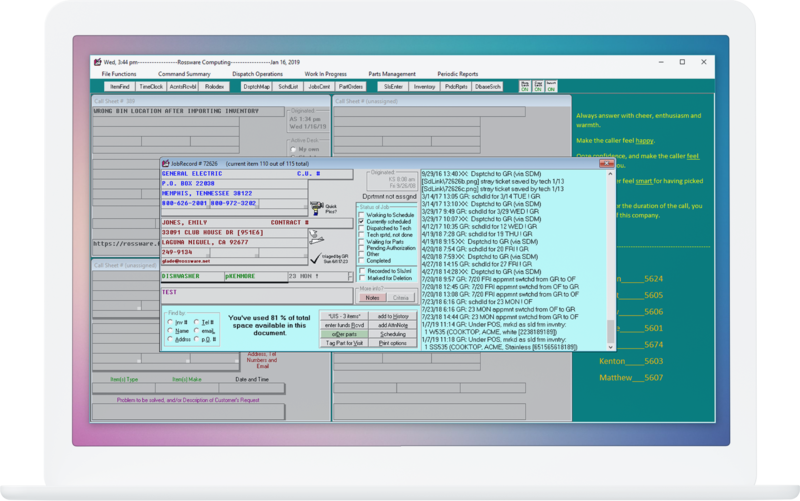 Create and records special orders with direct, internal fax transmission to suppliers. Tracks each item of money received, assuring no payment is credited unless actual money reaches deposit (or you know about it). 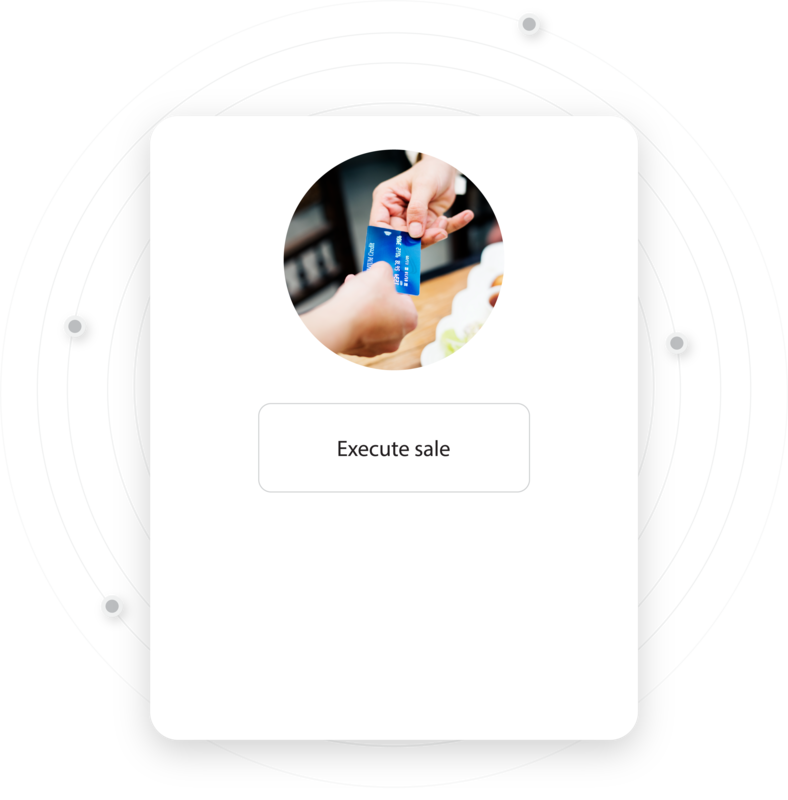 ServiceDesk has a built in Virtual Credit Card Terminal enabling you to charge credit cards cheaper and easier than ever before. 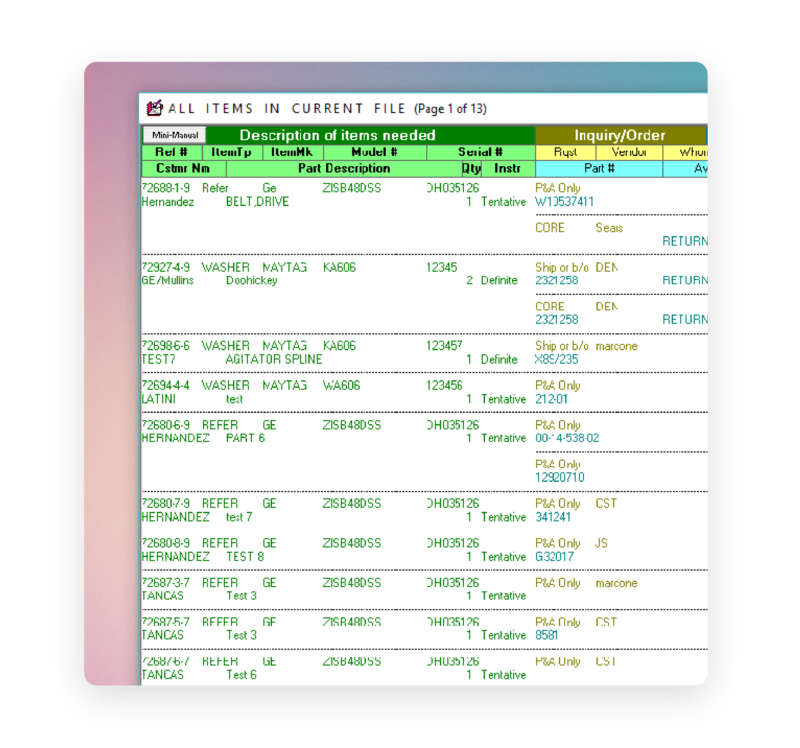 Records sale and completion of each job, compiles record of all sales, generates periodic reports showing totals, percentages in various categories, etc. Creates accounts receivable records, manages periodic dunning on past due accounts. Understanding your business is perhaps the most important part of running it. ServiceDesk helps you gain insight into every aspect of your business with detailed customizable reports. The reports are even exportable! *If at any time within twelve months from your date of purchase, you have fully implemented ServiceDesk for a minimum of 30 days and find that it does not suit your needs, you may return the product for a full refund. At Rossware we believe our products truly are the best available for your service business. So much so that we offer, and have always offered, a 100 percent, money back, satisfaction guarantee. Our support team is capable of answering any questions you have about the product, or even providing a demo.